On the afternoon of Aug. 9, I was getting ready to give a talk about Palestinian olive trees to a gathering of authors and thinkers at Keystone College in Pennsylvania. For the title of the presentation, I cracked the word olive in two, and turned it into O' Live! But death mocked me. Shortly before I left my room for the talk, the phone rang. It was my friend, musician Saed Muhssin, calling me from San Francisco. His voice was deep like a valley, barely climbing up to speak: "Have you heard?" he asked. "This is hard news," he warned. "Mahmoud Darwish died today." My mind cried. My heart ached with all of the unhealed Palestinian losses that are recalled with each new loss—losses Darwish made sure to record in his poetry. "I belong there. I have many memories," Darwish wrote. Memories that he recorded in at least 30 books of poetry and prose, translated into at least 20 languages. He was born in 1941, and published his first book of poetry before he was 20 years old. For over four decades, Palestinian and Arab poets were inspired by him, referred to him, imitated him, debated over his poetry. Saed and I belong to Generation M, an identity we invented several years ago. I grew up on the West Bank under Israeli occupation and Saed was an Israeli citizen. Both of us Palestinian, we had completely different lives. But underneath, we shared a similar deprivation, a hunger for freedom, for a more beautiful world. We filled our hunger with the poetry of Mahmoud Darwish, and we called ourselves Generation M.
I ache for my mother's coffee. He used the Arabic word ahennu for yearn, which means a yearning filled with affection. It's a word that wakes up a thousand feelings at once, with the hint of a desperate impatience. In 1982, he wrote "lasta wahdaka"—you are not alone, for Yasser Arafat when the Palestinians were driven out of Beirut. Darwish said it also to everyone on Earth, anyone who was forced out into exile for the nth time. And his question: "Where should the birds fly after the last sky?" made me invent an endless number of new skies, stacked like mattresses for the refugees of Earth. Darwish, the name in Arabic means a pure, spiritual wandering man, was precisely that for us. He moved between skies and across borders—between Palestine, Israel, Russia, France, Jordan, Lebanon, Egypt, and other countries. Wherever he was, words in his hands were a magic lamp that set free the genie of the Arabic language. He knew the heart of the Palestinians. He knew that they had only one wish for the genie, one yearning request of their language—"home." As seen in his language and poetry, Darwish had a vision and passion for achieving justice. He helped in writing Arafat's famous address to the United Nations General Assembly in 1974 in which Arafat pleaded with the world by repeating three times, "La tusqeto al-ghusna al-akhdar min yadee"—don't let the green branch fall from my hands. In 1988, Darwish drafted the Palestinian declaration of independence in which he said that peace is achievable with a two-state solution—one Palestinian, one Jewish. He wrote that peace is possible "on the land of love and peace." Inspired by the vision of reconciliation, he emphasized that Palestine would be a society that thrives on human rights, equality, democracy, representation, social responsibility, and complete respect for all, especially women and people of different faiths. 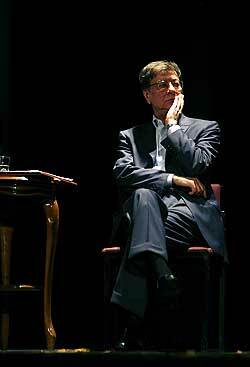 At one of Darwish's last performances, in July 2008, the audience in Ramallah received him as though they suspected it might be the last time they would see him. They stood up like the fragrant spruce trees he often plants in his poetry. "Think of others," he told them. As you prepare your breakfast—think of others. Don't forget to feed the pigeons. As you conduct your wars—think of others. Don't forget those who want peace. As you pay your water bill—think of others. Think of those who only have clouds to drink from. As you go home, your own home—think of others—don't forget those who live in tents. As you sleep and count the planets, think of others—there are people who have no place to sleep. As you liberate yourself with metaphors, think of others—those who have lost their right to speak. And as you think of distant others—think of yourself and say, "I wish I were a candle in the darkness." Speaking openly about death, he had confessed to Al Hayat, the Arab newspaper: "I am no longer afraid of death. I used to be afraid of it. But now I only fear the death of my ability to write and my ability to taste life." Continuing to wrestle with his art, he wrote, "I thought poetry could change everything, could change history and could humanize.… Now I think that poetry changes only the poet." Dear Mahmoud Darwish, your poetry changed me. Ibtisam Barakat is the author of Tasting the Sky: A Palestinian Childhood (Farrar, Straus, and Giroux, 2007) and founder of Write Your Life seminars, which encourage people to find their voice. This article was written for the Common Ground News Service.